HAMILTON - A Brilliant man is facing capital murder charges after allegedly starting a structure fire with the intent of killing his wife. Troy Arthur James, 38, Brilliant, has been charged in the death of his wife, Tracy Lynn Forthman, 41, Brilliant. The couple had been married for about a year, according to authorities. 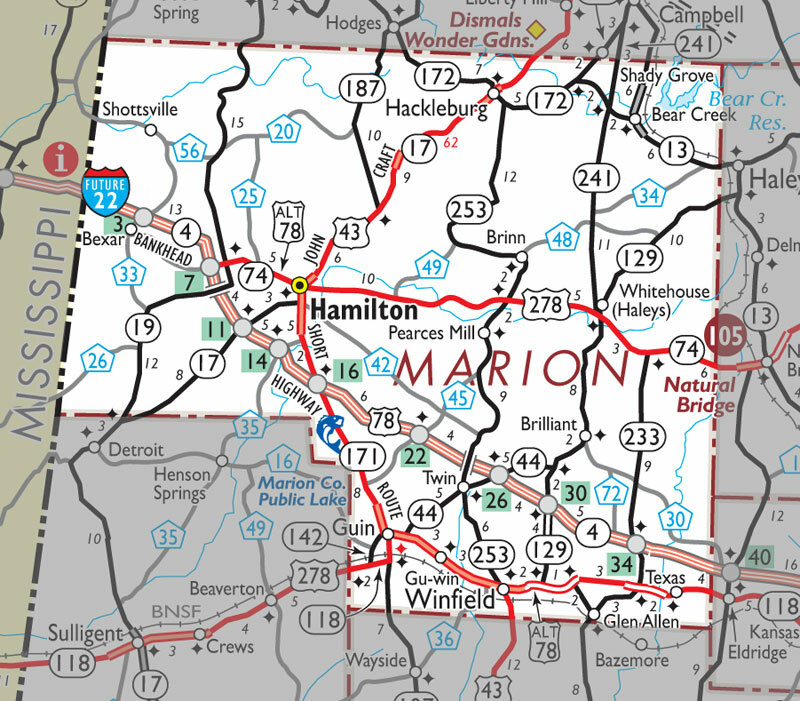 He will be retained at the Marion County Jail in Hamilton without bond throughout the trial. James’ first appearance in a Marion County courtroom came less than 24 hours after the event in downtown Brilliant. He was arrested around 3 a.m. on Friday, June 24, with his appearance in Marion County Circuit Court Judge John Bentley’s courtroom coming shortly after 1 p.m. the same day. Defendants are provided by law an initial hearing within 72 hours of their arrest. He was arrested by officers at the Brilliant Police Department less than six hours after the blaze is believed to have been started. “Much of this still remains under investigation,’’ Brilliant Police Department Investigator Kevin Bryant said in an interview with the Journal Record on Friday, June 24. The investigator said there was no way to say with any degree of certainty if the victim had been killed prior to the fire or if her death were caused by the blaze. Bryant said he was also unable to speculate at this time the suspect’s motive in the killing, although he said early findings at the scene are assisting officers in pulling together a possible scenario. Forensic information will be used to determined the cause of Forthman’s death, Bryant said, while also noting there were no eyewitnesses to the apparent confrontation between the husband and wife. Bryant said James has no prior criminal history in the state, but had moved here from Kentucky about the time the couple had married. Emergency crews rushed to the scene after an officer with the police department noticed the fire while on patrol. The home where the incident occurred is located just down the street from the police station. The body inside the structure was discovered by a member of the Brilliant Volunteer Fire Department, Bryant added. Assisting at the scene were the Alabama State Fire Marshal and fire crews from Brilliant, Winfield, Twin and Pea Ridge, as well as officers with the Marion County Sheriff’s Department, according to the investigator. Crews remained at the scene from just before 9:30 p.m. on Thursday until almost 3:30 a.m. on Friday. In an interview with Brilliant Volunteer Fire Department Chief Meredith Green, it was noted the victim’s body was found in a bedroom located in the rear of the house. But reaching this part of the home proved difficult for firemen in the early stages. “This was an older house with a lot of tongue-and-groove flooring and other wood, such as presswood, so it heated up quickly and made it tough for the crews to work their way in,’’ Green said. Green said he would not be able to provide details from the scene while the investigation was still underway. Asked if there were signs of a struggle inside the house, the fire chief said he could not speculate since such damage had been caused by the fire. “There was a lot of damage to the entire house,’’ he said. The fire chief was informed of comments made during the suspect’s court appearance of an accelerant being used in the blaze. Green chose not to offer any further comment pending the investigation’s completion other than confirming such a substance had apparently been used. “But I do want to offer my appreciation to all of the local departments who assisted in the fire,’’ Green noted. In the 39-minute appearance in Bentley’s court, the defendant noted he was unable to afford an attorney with the judge saying he would name two to serve as James’ defense team. Hamilton attorney Jeremy Streetman was named to serve as co-counsel in the case with Bentley saying he would name lead counsel in the coming days. The judge said he had attempted to contact an attorney outside of the 25th Judicial Circuit regarding serving in that role, but had been unable to do so prior to the initial hearing. “The purpose of this hearing is establish that the defendant has an understanding of what the charges are against him,’’ said Bentley from the bench. Bentley stressed that the issue of guilt or innocence would not be debated by attorneys as part of this initial hearing. However, the judge clarified that the case would be defined as a capital murder case, meaning the defendant would be subject to either life in prison without the possibility of parole or the death penalty, if convicted. Reading the charges against James, the judge noted that the defendant was charged in the victim’s death, adding that an accelerant had been used to cause the fire to spread more rapidly. The building in which the victim was killed is located at 915 Main Street in Brilliant, just a few feet from the local police station. James is also charged with intentionally inflicted harm on the property damaged in the fire. The defendant was reminded that any comments made in the courtroom could be used against him in the actual proceedings in which guilt or innocence was to be determined. Asked if he understood the charges against him, James said, “Yes, I do,’’ while fighting back tears and sobbing openly in the courtroom. James was informed that since this case was considered a felony, he would be allowed to request a preliminary hearing. In such a hearing, a judge decides if enough evidence exist to hand over the case to a grand jury. In the end, James requested such a hearing with the judge setting the hearing for 1 p.m. on Thursday, Aug. 18. Alleged murderer Troy Arthur James is shown leaving a Marion County courtroom on Friday, June 24. Shown behind the suspect are (foreground) Marion County jailer Joe Vasquez and (background) James’ appointed legal co-counsel, Jeremy Streetman.